The world needs a smart new guitar amp that can surpass all the expectations of the modern-day guitarist who demands the highest in tonal integrity. With that in mind, Thomas Blug and an experienced team have worked together to design, develop and release AMP1. AMP1 delivers a wide tonal palette, from jazz to metal, in professional quality. Thomas's dream was to put the immense power and character of vintage tube amplifiers into one small package that would fit into any glove compartment or gigbag - without compromising on the tones. Mission accomplished! Versatile and loud AMP1 is designed for professional use onstage and in the studio. The Nanotube 100-watt power amp delivers your own tonal palette with the best tube quality and enormous sound pressure levels. Four amazing, modifiable channels will take you on a stunning journey through the history of the guitar amp (from Clean to Vintage to Classic and Modern tones), and AMP1 also features switchable and adjustable Boost and Reverb controls, three integrated footswitches, a truly outstanding Speaker Simulation output for recording, and a headphone output, giving you all the options you would expect from a modern, boutique tube amp. 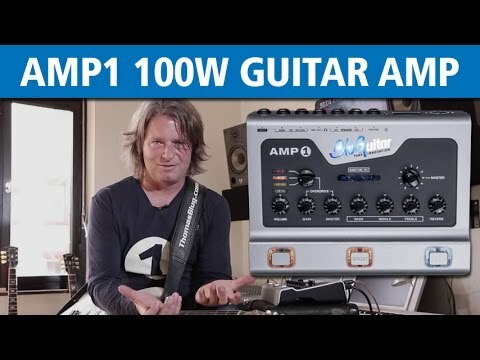 Do you own BluGuitar AMP1 or have you had a chance to try it?